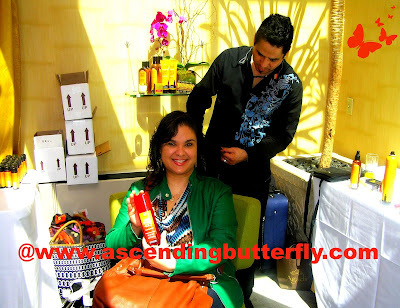 Last week the Rooftop bar of the Library Hotel in New York City was transformed into a Moroccan Paradise for the Agadir International's 'Journey to Morocco with Agadir Argan Oil' event. 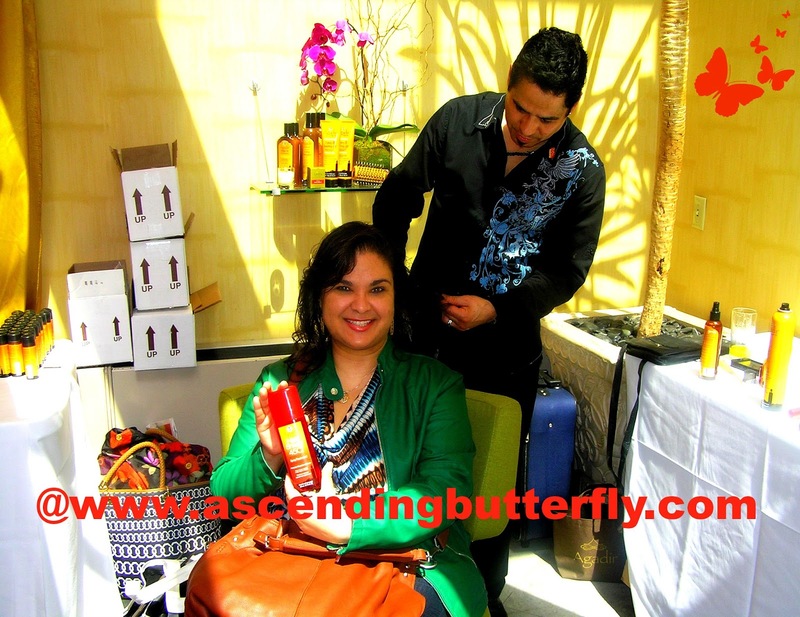 Guests were able to indulge in Manicures, Massages, Henna Tattoos, as well as hair styling to help match each guest to the appropriate Agadir Argan Oil Product for their hair. 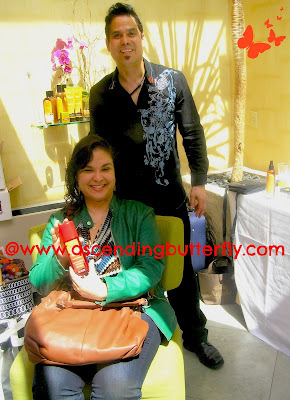 I was able to get a walk through of each of the products in the line, and I followed that with hair styling and a very helpful hair consultation with Carlos who asked all the right questions about my hair and my morning routine to help match me to the right products. Since I blow dry my hair daily and flat iron often, he recommended (as well as used on my hair on the spot) the Heat Shield 450 which will protect hair from high heat styling appliances like Blow Dryers and Flat irons, and because I have fine hair he also recommended the Volumizing Shampoo and Conditioner. Stylist Carlos gave me great ideas on what to do with my hair this summer at the Agadir Argan Oil Moroccan Spa Day Event at the Library Hotel in New York City! I will tell you that after having it used on my hair I found it to be one of the most light weight Argan Oils I've tried so far, it didn't make the scalp and the hair toward the front look greasy at all, and it also offered me true versatility, whether I choose to wear it curly or straight, my hair looked shinier and healthier, it did hold the curl well and the front of my hair which was styled straight stayed straight. Stylist Carlos is adding the finishing touches to my hair! I am holding the Heat Shield 450 Plus Treatment. Agadir™ Argan Oil is extracted from the rare and exotic nut (cross between a walnut and almond) of the Argan tree. This wonder oil has the characteristics of being very lightweight and non-greasy. Its conditioning powers are beyond compare when combined with our fine, professional formulation. Argan oil has a low molecular weight, which instantly penetrates into the hair shaft, without weighing the hair down. Agadir™ Argan Oil Hair Treatment is left in the hair for continuous conditioning, leaving it soft, silky, manageable with a long lasting, luxurious shine. Ƹ̵̡Ӝ̵̨̄Ʒ - Paraben AND Sulfate Free! While I haven't had a chance to try out all the products that Carlos recommended that I got to take home, I did like the results he achieved with just the Heat Shield 450 plus Spray Treatment (that protects, repairs and shines!) and the Agadir™ Volumizing Hair Spray - Firm Hold. It helped me keep the soft, frizz free curl he added to my hair all day. Because I do have fine hair, he recommended the Volumizing products to help give my hair body, and still having the added benefits that Argan Oil offers the hair. They also have a blow dry round brush that actually has Argan Oil infused into bristles of the brush already, which helps to cut down styling time since the product is already infused into the brush! I have to tell you this brush totally ROCKS! 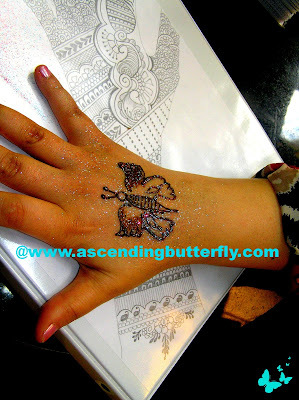 Got a blush of pink nail polish at the Mani Station plus a super cute Henna Butterfly Tattoo! I also stopped over at the Manicure Station (they did my nails in the softest hint of pink!) and then followed that with my very first Henna Tattoo, I asked for a Henna Butterfly and couldn't be more thrilled with my Butterfly! Later in the day the puffy top layer drops off and you are left with the Henna Tattoo on your skin that lasts about 2 weeks! We even had the option of adding Glitter to the Henna Tattoo which I definitely said yes to! It was also nice to have the chance to eat, enjoy the view on the outside of the rooftop and catch up with my favorite New York Bloggers! 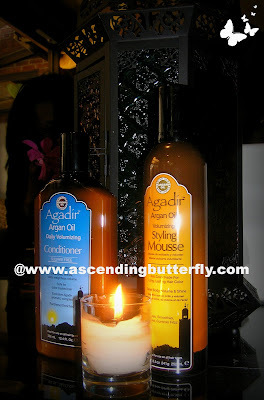 Butterflies Agadir Argan Oil is definitely one to watch and put on your Haircare Radar! Right now they are being sold exclusively in salons, but they plan to roll out their website so that consumers may purchase the products online at their site. They did let me know that if you see it right now both online and even at Mass Market Drug Stores, the products you are seeing are more than likely fakes or even expired product which would make it less effective, so only buy these at the Salon for now until they are available for purchase directly from the Agadir International website. I noticed that it seemed to really work well for ALL types of hair. 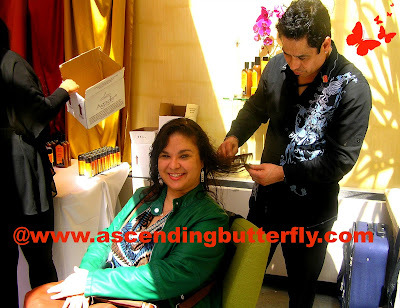 While I was at each station I got the chance to see different people getting styled, and the products really worked well for such a diverse and wide variety of hair types. Once I have had the opportunity to try out the entire line from A to Z on a regular basis, I will definitely report back to you with additional feedback! Butterflies, Have you already tried Agadir Argan Oil? If so, please let us know how it is working for you! FTC Dislcosure: This is NOT a Sponsored Post, no compensation has been received to share our feedback of the preview press launch, we were fed, pampered and given gift bags, all opinions are 100% my own! I think I have a sample of this (or had) that I received from either ABS Chicago or Latino Fashion Week. I might just dig it out and try it. @Ashley - You definitely should! I love that it's a lighter feel formulation, but provides the exact same benefits, without making my hair feel 'greasy'. When you try it out, please let me know what you think! Love the way the Agadir™ Argan Oil made your hair look!Seems like you had a great time ( that's the way to make life enjoyable). 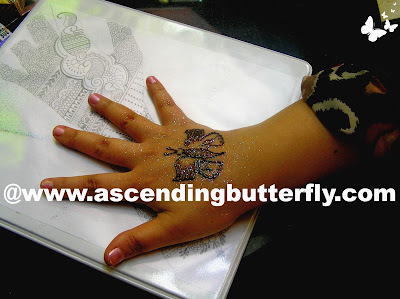 A glittery butterfly'S not bad either!